Why is it named ‘safe-for-all’? The reason being (which explained by the chef in the show), this dish would be an easy-to-consume fish dish for all ages. From the aged to young diners, there is no need to worry about nor watch out for fish bones while having fed in large mouthful scoops. This is simply a delicious soft fish-egg dish that pleases everyone here! 1) Mix eggs, prawn paste, tofu, mushrooms, Char siew, oyster sauce, salt, sugar, pepper and cornstarch together in a bowl. Mince with metal fork to combine well. 2) Place the paste-like egg solution evenly on a large dish. 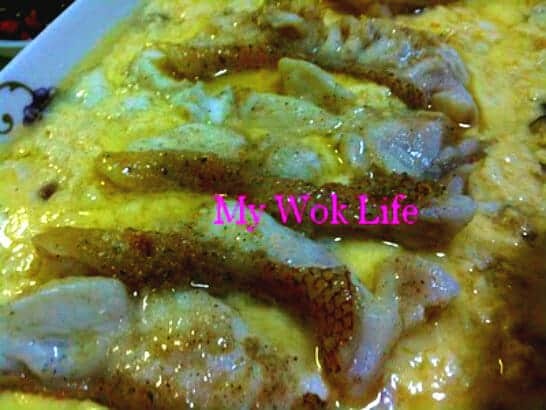 Arrange fish fillets on top of the egg paste. 3) Then, steam on a wire rack in wok with water just slightly above the rack, with lid on. Or, place in electrical steamer. Both methods using high heat, steam for 6 minutes. A portion of my fish egg dish counts about 150kcal. Healthy and low fat food for all! Tips: Do not over steam the dish to retain the correct tenderness of the fish and egg. * Make 101% sure that the fish fillets are bone free, before cooking. Is there an alternative to using prawn paste for this dish? If I omit using prawn paste, will it make a difference to the taste? Is it alright if I don’t add char siew? You may use fish paste instead. If omitting prawn paste might taste different, to me. However, it’s up to individual’s tastebud.